Man In Red Bandana Movie He went up, so others could come down. 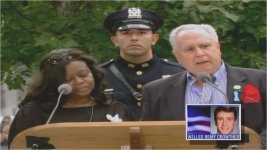 Welles Crowther is a 9/11 hero who “went up so others could come down”. His story became known 8 months following the tragedy due to an ordinary object ...a red bandana. Man In Red Bandana release date was Friday, September 8, 2017. This was a Limited in theaters release. This is a story of sacrifice, selflessness and how the actions of one man have touched and inspired others. 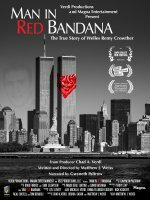 Our film is about Welles Crowther, a 9/11 hero. Welles was tragically killed in the lobby of the South Tower when it collapsed. He stayed to help others and his heroics only became known 8 months after the tragedy due to an ordinary object ... a red bandana. The film re-traces the unique manner in which his heroics became known, as well as his last inspirational hour (his finest hour) saving others from the upper reaches of the South Tower. The film, then, depicts Welles’ folklore stature throughout the United States including songs, artwork and babies that have been named in his honor. This legacy section leads up to the revelation of a remarkable secret about Welles that provides the perfect, inspirational ending. First time that Oscar-winning actress Gwyneth Paltrow has ever narrated a documentary. 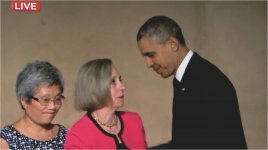 Film includes President Barack Obama honoring Welles Crowther, the subject of the film. Welles saved, at least, 10 people on 9/11 from the upper reaches of the South Tower. He could have escaped but decided to stay and help others. If he had left, he would have escaped from the highest floor of any survivor. Writer/director Matthew Weiss is a NY traffic lawyer who heard the story and, as a result, turned filmmaker. He worked 6 years to bring the story to the big screen.